Halo's Theater allows me to view, edit, save and share movies of my gameplay. From brief multiplayer skirmishes to hour-long campaign efforts, my recent outings are all preserved on the 360's hard drive. I can follow the events from a first-person view, just as I did as I played the game. Or I can detach the camera and explore the action from any angle I choose, pausing, slowing, fast-forwarding and even rewinding the action. And - here's where it gets interesting - I can take high-res screenshots, save them to my hard drive, and later download them onto my PC via my bungie.net Halo 3 service record. 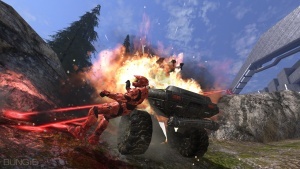 Since I discovered the Theater, I've been obsessed with screenshotting my Halo 3 adventures. The process mimics real-life photography in so many ways. The right lighting is key, for example. Camera placement is critical. Timing is essential. I've been so caught up in snapping shots I've found myself making other traditional photographic considerations, including many that don't even apply to the Theater's screenshot camera: Would a wider-angle lens make this shot better? What if I could open up the aperture to drop the field depth, isolating my subject against the background? Would a slower shutter speed, and the resulting blur, add a sense of motion and speed to the scene? There's only so much creative control the Theater photography offers, but the benefits of the system are incredible. In real-life photography, you'll never be able to freeze and rewind a scene, or examine it from every possible angle like you can with Halo 3's camera. In some ways, it's an action photographer's dream. You never miss a shot. The exposure is always perfect. Your subject is never out of focus. Including the Theater mode is a gutsy move on Bungie's part, considering how easily it allows players to discover and document flaws or glitches. I've occasionally found visual effects that aren't quite rendered in the correct location, for example, or noticed some clipping or other minor flaws. But for the most part, Halo 3, to its creators' credit, typically looks more incredible in stop-motion fly-throughs than it does at its standard breakneck pace. As I've carefully maneuvered my camera through former games I've realized just how much of Halo 3's artistry I've missed. I always loved the way real-life photography gave me a new appreciation of my subject. The same happens as I'm snapping images from Halo 3. Where once I saw a standard sci-fi shooter with somewhat generic art design, I now see a painstakingly detailed world. I burned through Halo 3's entire campaign without once examining the intricate instrumentation of the Ghost's control panels or the lovely, cerulean ripples of plasma that sparkle around the barrels of its cannons as they fire. I never really appreciated the fleeting crackles of yellow energy that dance, weblike, across players' bodies as their shields go down. I didn't notice the precision of the animations that unfold as one player sticks another with a Spike Grenade.